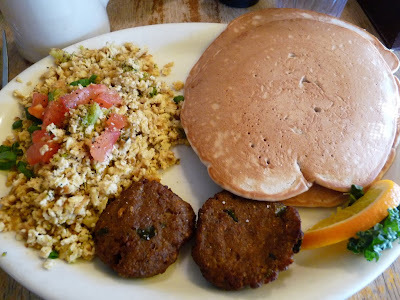 The Vegan Breakfast Platter at Kerbey Lane Cafe in Austin. I've barely posted at all this week! After the marathon, I marveled at how quickly my body recovered but, as the week wore on, I started to notice little pains and pockets of soreness. Two nights ago, I woke up at 4am with a killer leg cramp that left me achy the whole next day. The blister on top of a blister made my big toe throb painfully until I finally popped it. And while I'd love to go for a short, easy run, my body seems to want the rest more, so I'm giving my body a restful week. My body has earned it. Outside of marathon recovery, this has actually been a really great week. In fact, I think I have nothing but +'s to share with you. Don't you love weeks like that? + Nathan and I are now super obsessed owners of shiny new iPhones. I am all about apps right now. I found one called "Is Your Beer Vegan?" which has already come in handy (much to my disappointment - RIP Sam Adams Cherry Wheat!). + Yesterday was Nathan's 29th birthday. I am so glad that Nathan was born! + Yesterday I also found out that my travel has been approved for the WebWise conference in Denver. I've been to this conference the last two years and it's my favorite. The fact that I am going is a welcome surprise! + Also yesterday - it really was a banner day - I received news that a short story I submitted to LIT Magazine had been accepted for publication! This was pretty much the best news ever - especially after so many disappointments at work, and the rejection from Madison, and the waiting waiting waiting to hear from other MFA programs. I'm really excited and honored by this opportunity and cannot WAIT to see my words in print! + And, since I was on such a roll, I went ahead and purchased two tickets to Oregon for Spring Break so that Nathan and I can visit Kealy. I haven't seen Kealy in over two years (tragic!) and am looking forward to remedying that in less than a month(!). I hope that you have had an equally good week, and I hope this trend continues! Happy Friday!